My full name is Antonio F. (for Francisco) Toledo. Antonio is a tradition in my family for several generations and Francisco is in memory of my Grandfather from my Mother’s side. I was born in Melilla, a Spanish city located on the North African coast, across the Alboran Sea from the Spanish southern coast. However, I just lived there for a very short time. Although it was where my parents were born, the rest of my ancestors from both sides were from what we call “La Peninsula”, the Spanish Main territory, where we soon moved back due to my Father’s commitments in the military. During my early age, we moved around several places in Spain as consequence of my father’s duties. Finally, we got established in Valencia, where I felt I was belonging to, spending very important years of my childhood there. Marbella, the touristic town next to Malaga, was a place where we spent some summer times since the beginning, also becoming the place I was sort of attached to. After high school, my studies took me to Barcelona and Cadiz, where I went through the Faculty of Nautical Science program to get my Degree (Masters) in Navigation and Maritime Transport. At the present time, my home is in Marbella, Spain, in the Costa del Sol, a well-known place for it nice clime, animated beach clubs and touristic interest. Q: What brought you to sea? I think Melilla played an important role, amd especially those trips to spend summer time in Marbella. 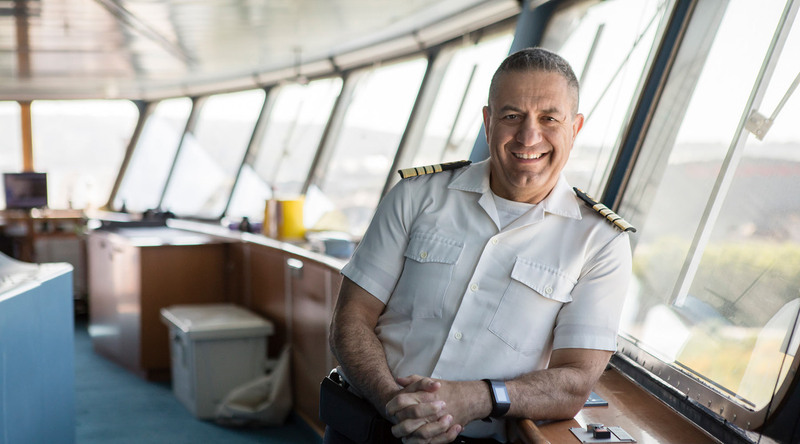 Since an early age I knew I wanted to be at sea, and probably… captain of a cruise ship! Melilla airport was small, and so were the planes. In those times the main connection with “La Peninsula” (Spain main land) was the post ship, in Spanish called “El Correo”, carrying people, goods, cars, mail… everything from the main land, and opposite. One of the Sunday attractions for the family, kids and people just spending some relaxing time was to go to the port and walk on the breakwater, next to the sea, looking at the horizon waiting for “El Correo” and observe her approaching, entering and the docking. We have to add all those waiting for relatives and loved arriving, so the area was very animated and created a pleasant ambience. The smell of the sea, the breeze and the image of the ship approaching from the distance was very inspiring I guess. Also my trips to Malaga (Marbella) on that ship were very special. They ere relatively long, between 8 to 10 hours, 12 at times, depending on the period of the day or week (they adjusted times for official arrival/departure). It was impossible for me to stay quite in a place or in the cabin, I was looking for the engines, for the bridge, searching for sea life, or just watching the waves… so I could say I was hooked then. When I was 15, I joined the Red Cross at Sea in Valencia as a volunteer. I was assigned to patrol the Spanish coastline of that area on a RIB (Rigid Inflatable Boat) over the weekends. It never minded the weather, it could raining cats and dogs or the sea covered in white waves, we were going out. Those patrols were so much fun! We conducted Search & Rescue missions along the coast, and sometimes covered by helicopter. It was very exciting and I learned a lot. I fell in love with sailboats when I was starting in the university. I was sailing over the weekends on different classes of sailing boats, such as 420, Flying Dutchman, Hobby Cat, and other types. Sometimes racing sometimes just for fun, the important thing was to sail! In my 20”s I was selected to join the expedition commemorating the 5th centenary of the Discovery of the Americas, to study how Christopher Columbus crossed the Atlantic Ocean and understand the sailing, navigation and ship construction techniques of the XV century. The project required reproducing Columbus’ three ships, handmade and hand rigged using that old technology and materials. I spend more than two years, 1990-1992, working on this project sailing on the Santa Maria. Three sets were built. ON the first set, we sailed all over Spain and part of Europe, for the first year, then a second was built and crossed the Atlantic, only using classic navigation. We sailed around the Caribbean and the complete East Coast of the USA. At the end, one set was left in a museum in Palos de La Frontera, Huelva, Spain, where the vessels can be visited, and the second set laid in Corpus Christie, Texas. This expedition experience changed my life, in many senses. I am currently an Officer in the Spanish Marine Corps, Stand by Reserve, but for now I have been transferred to the General Corp, being activated every year as an NCAGS officer, which is part of the NATO organization. Annual exercises are carried out where my mission is to coordinate the interactions between merchant ships and military forces in area of conflict, in order to identify enemies and threats from/to friend units and take the necessary actions. Very interesting for the times we are living in. Q: What are your favorite activities, besides sailing? I love many different things, with a tendency to the action stuff. Scuba diving, snowboarding, alpinism in snow and ice, survival, 4x4 expeditions, horseback riding, gym and fitness and everything that can be in nature. But I also like to relax, discovering new places, new people and cultures, new food or enjoy a movie or a book. I love tapas obviously, but I am absolutely crazy for BBQs! Q: What does your cruise line career entail? After serving some time in the Navy and starting on some small passenger vessels, I joined Renaissance Cruises (the builders of the R class ships), participating in the new building and sailing on many of their vessels. After the Renaissance end, I still sailed on the R class ships for a while when they were chartered, but slowly my path took me to different companies starting from Windjammer to Iberojet/Ibero Cruises, ending within the Carnival group under Costa. Five years ago I joined Royal Caribbean, within Pullmantur Brand, commanding the Sovereign. During all this time I have been traveling and sailing in many different places and oceans in the world. Obviously I went through all different positions, from Cadet, Officer, Safety Officer, Staff Captain and finally Captain, with my first command being the R Six! After Sovereign, I went for my last two and half years as Marine Director shore side, linking the Madrid office with Miami within the Royal Caribbean umbrella. So finally Azamara acquired the Pursuit… and here I am! Q: Do you have a favorite port or destination? It’s difficult for me to pick a favorite. Each place has its own unique identity and things to discover and enjoy. So I could go from the South Pacific, Polynesia, to St Petersburg, Russia, passing by Ushuaia, Patagonia Argentina, the Norwegian Fjords, New Zealand, the Polar areas, or the Greek Isles and I will not be able to say which one I have enjoyed more. Q: Is there any place you haven’t been you’re looking forward to cruising to? Yes, to Israel! I’ll be Captain of the Pursuit for those visits! Q: Do you have any personal motto you live by? I believe in teamwork. The ship is a team. The captain leads the team, but the captain is also a part of the team. My four objectives are team building, environmental protection, safety, and guest satisfaction. In short, to lead the ship and to make everyone happy. I am motivated by seeing guests smiling and enjoying their vacation because a vacation is the most important time of their year. And the crew smiles also! I’m also very much a conservationist…an environmental conservationist. I’m very concerned about our natural world, and the sea. We are all responsible for the protection of the natural world I’m proud of RCL’s support of the World Wildlife Fund. Q: What else don’t we know about you? Many things, but they need to be discovered! And in this sense I would say… who is Lily?